A decade after California gained statehood in 1850, its agricultural settlers in the Central Valley experienced two very different types of water-related disasters between 1861 and 1864. In the winter of 1861/62, a series of strong storms caused massive flooding in the valley, killing livestock, ruining crops, and turning the flat lowland into an inland sea 60 miles wide and 400 miles long. The following year, the valley experienced its worst drought in over a decade, and settlers were suddenly forced to cope with scarcity. Settlers had to constantly assess their situation: were they living through a particularly turbulent couple of years, or were these water fluctuations the new “normal” that they had to adjust to? The rise of irrigated agriculture in the 1870s gave an impression of water abundance and consistency in an otherwise erratic climate, obscuring the urgency of disaster adaptation during uneventful years, while at the same time attracting many new settlers to the fertile landscape. This growing agricultural empire, watered by a complex system of aqueducts, buffered the new inhabitants from wet and dry periods, thus creating the illusion of “normal” climatic variation. 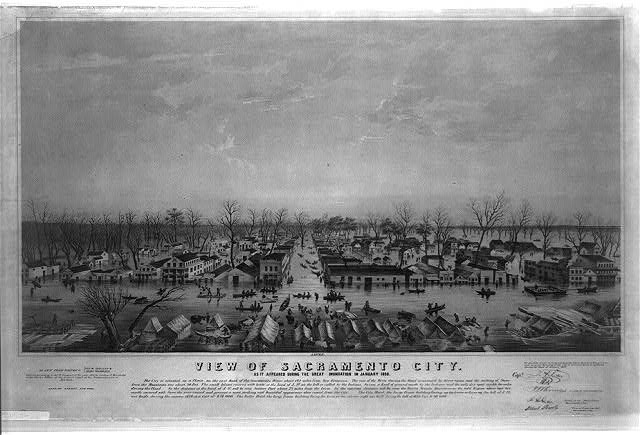 View of Sacramento City as it appeared during the great inundation of January 1850. The 1861 flood caused a similar scene. Drawn from nature by W. Casilear & Henry Bainbridge, lithography by Napoleon Sarony, LC Panoramic maps (2nd ed. ), 31.1, New York City, 1850. Courtesy of the Library of Congress Prints and Photographs Online Catalog. The great flood and drought of the early 1860s coincided with the completion of the Union Pacific Railroad in 1862, and with it, the potential to distribute crops nationwide. The valley had previously been regarded by prospective farmers as a desolate landscape, ill-suited to the water-intensive needs of wheat, barley, alfalfa, and other crops. Farmers relied on spring flooding for water through otherwise dry years. But the population was growing, and agriculture was becoming a dominant post-Gold Rush economic driver to meet growing local and national demand. “Boosters”—developers who promoted the land’s fertile potential to funders on the East Coast—envisioned a uniform agricultural landscape beyond the natural floodplains. 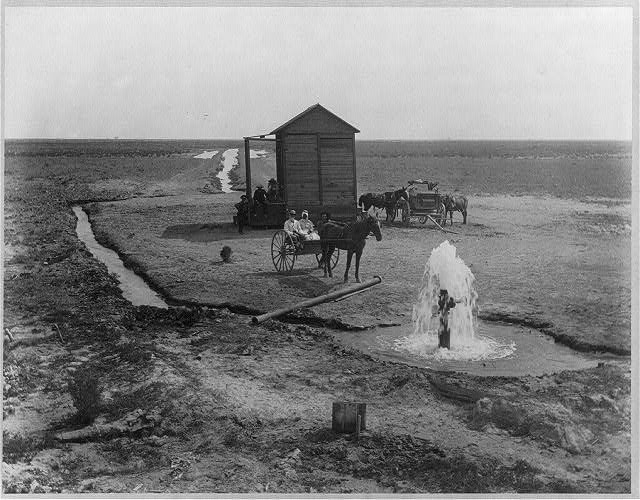 Horse-drawn cart beside artesian well in Kern County, California. Photo by Carleton E. Watkins, ca. 1880-1890. Courtesy of Library of Congress Prints and Photographs Online Catalog. But such an irrigated landscape would need the support of the new settlers themselves, and many were skeptical that irrigation would allow for more consistent production. Even by the 1870s, many Central Valley farmers adhered to the prevailing belief promoted by the land speculator Charles Dana Wilber that “rain follows the plow,” and viewed new irrigation techniques as inferior to pre-existing practices of crop rotation. They questioned the benefit of adding water to a parched and impenetrable surface. Moreover, they were wary of a uniform distribution system that seemed at odds with the local variation in water availability during the flood and drought of the previous decade. Irrigation’s promoters did not gain traction until the 1880s, when the development of machinery allowed farmers to diversify crops, boost production, and yield financial rewards. The Wright Act of 1887 authorized different irrigation districts (instead of individual farmers) to manage water, and thus allowed them to develop water infrastructure on their own terms. The concurrent development of technology to tap vast underground stores of water, large financial investments from the East Coast, and a growing commercial agriculture industry by rail enabled farmers to send their crops state- and nationwide. For example, between 1870 and 1890, the Central Valley became the second largest wheat producer in the country, with its wheat output growing from 16 million to over 40 million bushels. 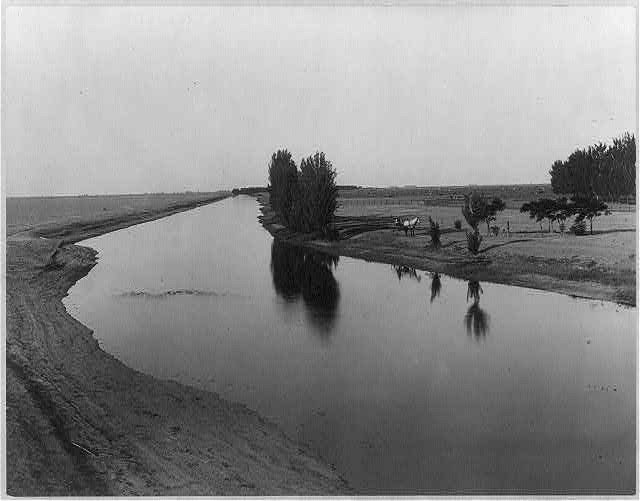 The Calloway Canal near the headquarters of the Poso Ranch in Kern County, California. Photo by Carleton E. Watkins ca. 1890. While the irrigation projects facilitated by the Wright Act eventually faded out in the 1890s, they represented a new era of centralized control over water in the Central Valley. By placing control in the hands of locally managed jurisdictions, irrigation districts provided the uniformly productive “normal” landscape that boosters sought. This created the illusion of abundance and consistency, and irrigation thus effectively softened—or at least postponed—the unsettling questions about “normal” fluctuations in water supplies that settlers had previously faced directly. As the memory of the flood and drought of the early 1860s faded, so too did the prospect of having to confront the natural variability of extreme weather events. Grant, Daniel. “The Watering of California’s Central Valley.” Environment & Society Portal, Arcadia (2015), no. 1. Rachel Carson Center for Environment and Society. https://doi.org/10.5282/rcc/6825. Hundley, Norris. The Great Thirst: Californians and Water: A History. Berkeley: University of California Press, 2001. Ingram, B. Lynn and Frances Malamud-Roam. The West Without Water: What Past Floods, Droughts, and Other Climatic Clues Tell Us About Tomorrow. Berkeley: University of California Press, 2013. Kelley, Robert. Battling the Inland Sea: Floods, Public Policy, and the Sacramento Valley. Berkeley: University of California Press, 1989. Olmstead, Alan and Paul Rhode. “An Overview of California Agricultural Mechanization, 1870-1930.” Agricultural History 62:3 (Summer 1988), pp. 86-112. Pisani, Donald. From the Family Farm to Agribusiness: The Irrigation Crusade in California and the West, 1850-1931. Berkeley: University of California Press, 1984. Daniel Grant is a graduate student in the Department of Geography at the University of Wisconsin-Madison. This article is part of a larger project to understand how floods and droughts are narrated as forms of “fast” and “slow” disasters.